Ferocitas, my 2014 KTM 390 Duke and I were amicably estranged for the better part of the last 12 months. Zubinn Design works slowly and methodically and their work is stunning. But on the flip side, Zubin tends to tend (erm, yeah) to the customer who's standing in front of him and that can push a project being monitored remotely, into the background. I will even admit to have gotten Feroci fettled while Ferocitas glared back balefully from the back of the garage at me. I'm sorry baby - never again, I promise. And it really is my baby, that KTM. It's run flawlessly, utterly flawlessly since the first day and at 18,000km it's the smoothest KTM 390 I, and most of the people I know, have ever had the pleasure of riding too. And yesterday, finally, I stood around at Zubinn Design as they tightened up the final few bolts, set sag and rebound on the new 2002-2003 Yamaha YZF-R6 rear shock, gave it a wash and handed the keys back to me. Lucky that Zubin is as slow with doing the accounts as he was with the Ferocitas refresh, heh heh. So far, the restore has been free, free, free. I'm waiting for the bill, Zu! The ride to work was brilliant. In capital letters. The engine's as smooth and immediate as I remember it and the KTM absolutely flies at the hint of a throttle opening. More than one crest caused the front wheel to catch some air and multiple speed breakers were despatched with its trademark hop too. The new suspension feels stiff but absorbs significant hits, and then the gloss of the new paint... I know I'm rambling. 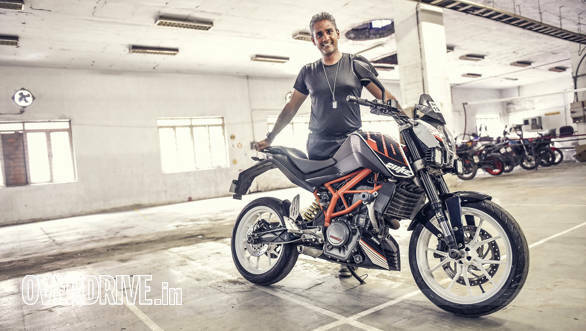 Shumi with his freshly restored 2014 KTM 390 Duke, "Ferocitas"
When I parked the bike in the office, I couldn't stop smiling. And the tides of euphoria wouldn't abate. I was almost giddy. At how well Ferocitas was running, as well as at having it back. I realised two things later. First, the motorcycles that evoke queasy feelings for my bank's relationship managers and cause my cheque book to catch fire always make me feel like this. It's why I'm convinced that the KTM 390 Duke, which doesn't even have EMIs or anything to worry about, is probably always going to be in my garage. Whenever I see it, I feel a primal drive - like you feel hunger, perhaps - to go for a ride. I'm rapidly becoming convinced that my 2016 Multistrada and my 2004 Yamaha R6 are both the same too. The R6 is farther away, for sure, but when I go to the racetrack and find it waiting for me, my heart beats faster and the leathers practically crawl out of the gear bag all by themselves. Second, while I test new motorcycles constantly, I now have a garage full of old bikes. A 14-year old four, a 19,000km twin and an 18,000km single. My old girls are all beautiful and this is such a wonderful place to be in. And now let me get to the point. The typical way to buy a new motorcycle is a rather complex one - much research has gone in to how you do this. People search for the bikes on the internet, they watch videos, they talk to their friends, they read the magazine road tests, they take test rides and... long process and everyone makes their decision based on all this and some sense of an emotional connect with the machine, all within their budget caps. But today let's talk about keeping bikes not buying them. Because there is no road test, video, website or salesperson who will tell you how to keep a bike rather than replace it. That decision comes from inside you. Think of your garage as a place full of interns in the form of motorcycles. Just like an office intern, you give them jobs, help them grow in confidence and skill, and look for qualities that you'd like to see in a permanent member of your team. The intern has to earn it. So should your motorcycle. Me? I'm keeping the motorcycles that make me swell with joy. Motorcycles that miles and years later, when flashier, faster and more amazing machines have been tasted thoroughly, still produce strong feelings. Motorcycles that think and work like you. Motorcycles that fill your life with their sounds, sensations and memories. Motorcycles like Ferocitas. Look hard for these motorcycles. Most are very, very good, but only the rarest will ever mean the world to you. And I believe it is vital that you do. Because life may be short, but let our rides be long. Because what the bike you ride says about you is far less important than what it says to you.